4 tablespoons of maca powder. 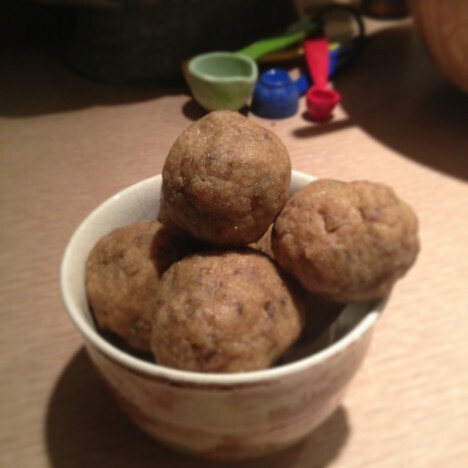 5 tablespoons of raw tahini. “What’s maca? !” I hear you say. Well, it’s an ancient superfood from Peru, a powdered root, that’s especially good for women, as it balances hormones. It also increases fertility and aids stamina in every way, but without the buzz of caffeine. As dates are also great for stamina, with their high percentage of complex sugars, and tahini is great for the reproductive system, and hair and nails due to its wonderful oils… well, 456 Fudge! is fabulously suited to every woman on the go. Just grab a ball or two on your way out the door, and you’ll enjoy your daily serving of maca while replenishing your hair and nails. Not to mention smiling a little more as they’re so delicious! They’re also incredibly quick and simple to make, and like many of my favorite recipes, only include a few ingredients. Five minutes prep, from start to finish. Eliminate power bars from your shopping cart forever! Take 12 medjool dates and slice them open. Extract the pits and discard. Using a large knife, mince the dates coarsely on a chopping board and transfer to a bowl. Simply squish into a paste, then roll into 12 balls of 1″ in diameter. Refrigerate, and they’re ready. If possible, eat one per day, as they’re very rich! by David Frenkiel and Luise Vindahl. Published by Rizzoli, 2013. 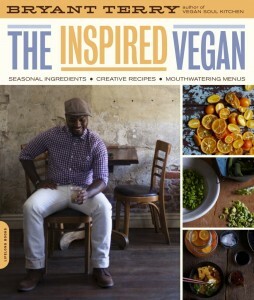 Looking for a cookbook that’s healthy, inspiring, and incredibly usable? Written by parents who blog, this book is exactly what is says on the cover. Everyday recipes that you can rely on to work after a busy day, for yourself and your children. What’s so great about this beautifully-photographed book isn’t the clarity of the language, or the modern feel of the photos and binding (although these elements are infinitely pleasing!). No, what’s important about this book is the simplicity. It’s simple to use. The ingredients are simple. The flavors are simple. The design is simple. It’s a simple book that gives cooks without any experience the tools they need to be vegetarian everyday. Staple vegetarian foods like nut milk, soup stock, and beansprouts are simply explained. Family dinners are there too, as are everyday recipes for breakfast and lunch. A few fancier recipes are there for treats and desserts, but at the root of this book is its everyday-ness. 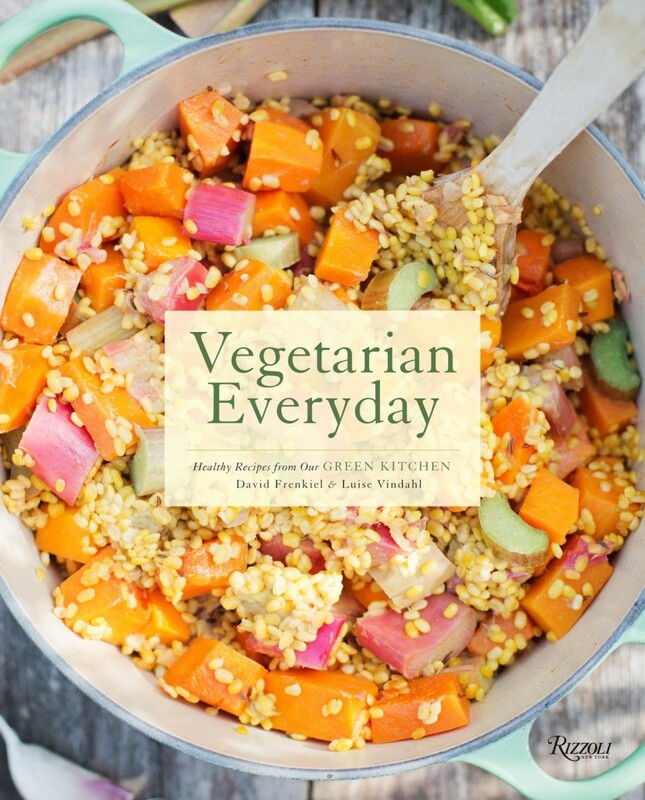 An instant classic your vegetarian family will turn to… everyday. What’s the definition of a desert island book? If it’s the one and only book you pack when you’re traveling from Los Angeles to London for the winter… well, that makes Raw Magic my desert island book! So much more than a cook book, Raw Magic is an encyclopaedia of every raw magic ingredient that has the power to make us feel good. It’s a potentially life-changing book. Seriously. It’s hard to describe without sounding too far-fetched, but adding these superfoods to my existing diet has dramatically improved my sense of well-being, cognitive skills, mood, and my physical appearance. I’m happier, smarter, more stable, slimmer, and have better skin simply from adding a few of these delicious ingredients into my daily diet. Note, this isn’t about excluding things… it’s about adding a few delicious natural ingredients. Because these raw ingredients really are magic, hence the name! I love Kate’s enthusiasm when describing how to eat deliciously and healthily. She is incredibly knowledgeable about these extremely rare ingredients, and she shares her knowledge in such a cool, easy to understand, and downright groovy way. There’s a zero dogma policy, a very inclusive philosophy that welcomes you, whatever your lifestyle. This book simply gives the facts, without judging or wagging its finger. For me, this book is 80% about the opening 77 pages, where in-depth descriptions are given of the raw magic ingredients recommended by Kate. This is the portion of the book that I refer to regularly, the place that offers daily guidance about which of these powerful potions to enjoy at each moment. That said, the 160 recipes that are contained in the rest of the book are also fabulously inspiring, with well-balanced flavours and practical instructions. They always work, always taste divine, and are very flexible if you decide you want to experiment with them. But this gushing review isn’t swayed by these factors; it’s simply my honest opinion, backed by the actions I took when packing this book as my one and only cook book for the winter. 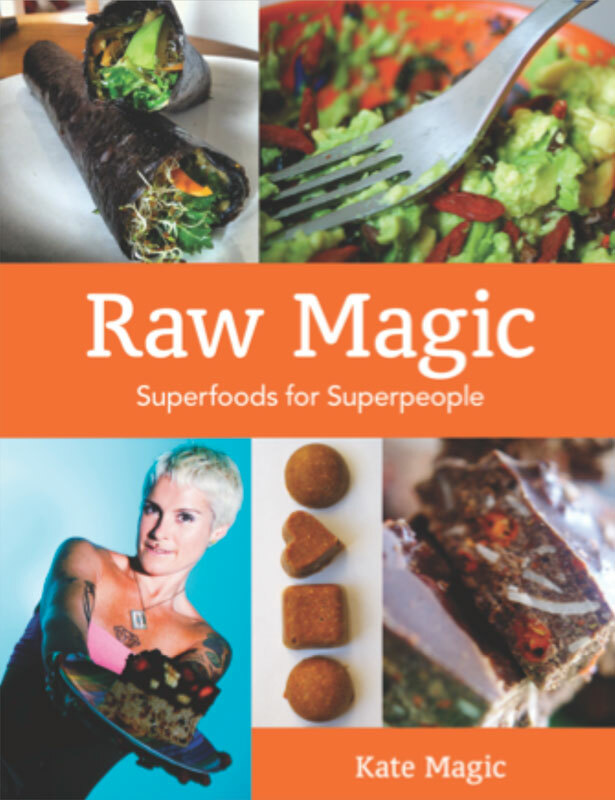 Treat yourself, pick up a copy of Raw Magic, and why not send one to a friend as well! There’s simply no better cookbook to detox this January, and to return to for inspiration throughout the year. 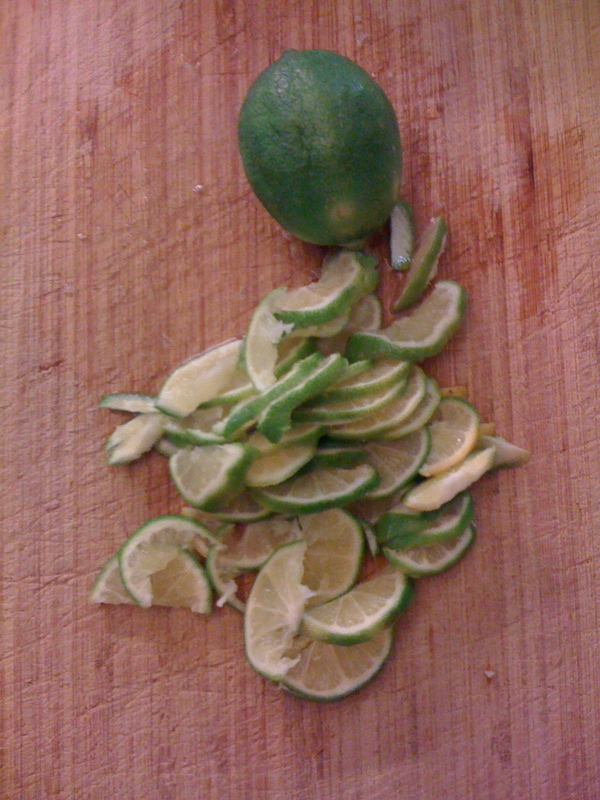 When life gives you lemons, make lemonade… and when your lime tree gives you limes, it’s time to make “W” Marmalade, especially if, like me, you’re a limey! Why “W”? Why not?! Being over-run with delicious, juicy limes, finding a little bottle of rose water in the cupboard, and then a piece of fresh ginger in my fridge, and simply because… whatever! There’s a very subtle hint of heat, from the ginger, and little bit of India in the fragrance of the rose. You may want to raise the volume of each or either of these exotic elements, as they’re both given at their most subtle quantities. They’re simply there to add a little je ne sais quois to the lime, which for sure shines all the brighter for having these lovely friends in the mix. 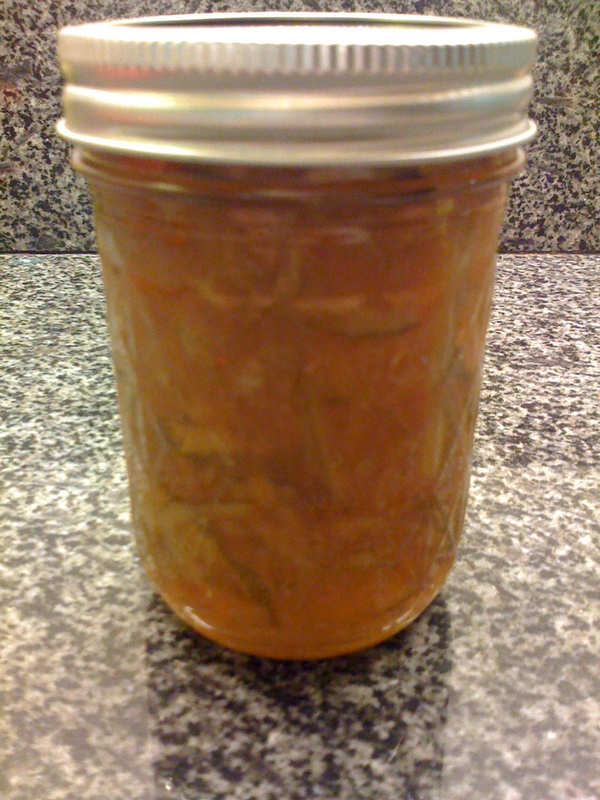 It makes about 12 x 8 oz mason jars of marmalade, plus a little bit extra to spread on your toast tonight. 1. 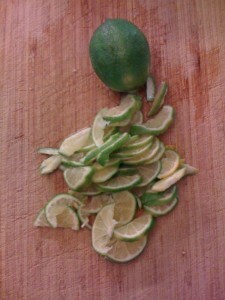 Cut each lime in half lengthwise, and slice as thinly as possible to make half moons, removing any seeds. 2. Combine the sliced limes, grated ginger, rose water and regular water in a china or plastic bowl, and leave to rest overnight in the fridge. 3. The next day, heat the lime mixture in a large saucepan until it’s boiling, and then reduce to a simmer. 4. In the biggest saucepan, simmer the limes on a very low heat with the lid on for about 40 minutes, until the rinds are soft. 5. Preheat an oven to 350 degrees F / 180 C / Gas Mark 4, and also, put the saucer in the freezer. 6. Heat the sugar in two baking trays for about 10 minutes, stirring occasionally with a wooden spoon. 7. Measure the lime mixture into a bowl with a measuring jug. It will measure about 10 cups, but it’s important to note the exact volume. 8. 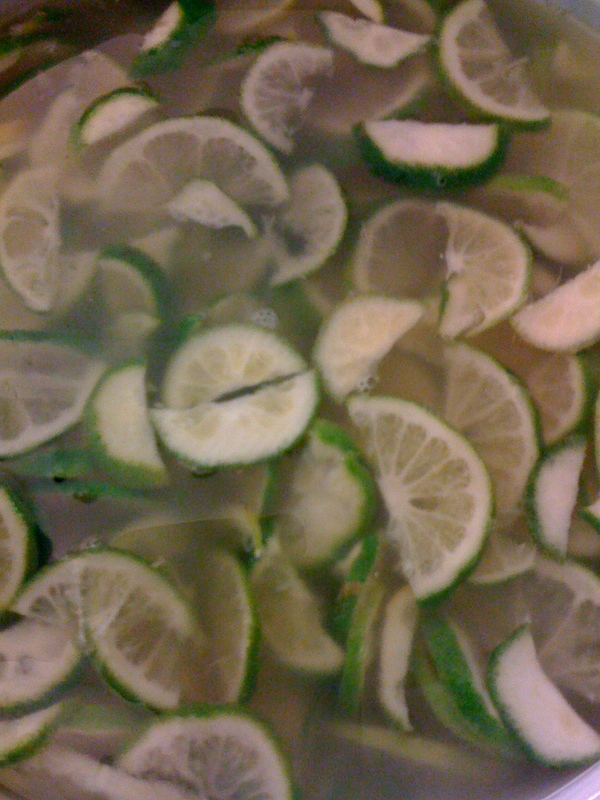 Pour the lime mixture back into the saucepan, and add exactly the same quantity of warm sugar. 9. Stir the mixture over a low heat until all of the sugar has dissolved. 10. When it has all dissolved, raise the heat to high and bring to a rapid boil. 11. Do not stir at all while it’s boiling. 12. Boil on high for 14 minutes. 13. Remove the pan from the heat, and wait for the bubbles to subside. 14. Carefully using the teaspoon, put a small amount of the marmalade onto the saucer, and put back in the freezer for about 3 minutes. 15. If the marmalade seems to be a good consistency, it’s done, if not, bring back to the boil for another 3 minutes, and repeat until it’s a good consistency. 16. Meanwhile, in the smaller saucepan, in batches, boil the glass mason jars (without their lids or rings). 17. After a few minutes, remove them from the water, and leave upturned on a clean tea towel to drain, covered in another cloth to keep them warm. 18. 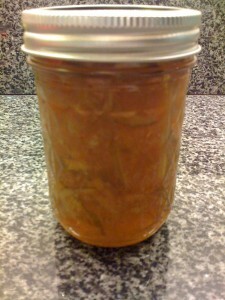 While the jars are still hot, fill them with hot marmalade, being careful not to trap air bubbles. 19. When the jars are all filled, use a butter knife or rubber spatula to gently pull around the inside of the jars to release any trapped air bubbles. 20. Wipe the jars clean with a damp cloth, especially the tops of the jars. 21. Place the lids onto the hot jars, and screw the rings down tight. 22. Using the tongs, lower the jars back into the boiling water so that the jars remain upright, and the lids are covered with boiling water by about 4″ / 8 cm. 23. Boil for 5 minutes, and repeat if boiling batches. 24. Remove from the boiling water, and leave to cool, upright, on the tea towel. Keep the marmalade at room temperate in a dark cupboard, or in the fridge after the jar is opened. It will be delicious and safe to eat for at least 6 months, but probably for well over a year. If it’s not eaten up immediately! I love to make cakes, cookies and desserts that are delicious, pretty, and can be enjoyed by everyone around the dinner table. This means, it’s got to be decadent enough that your ‘regular Joe’ will want a second piece, but it also has to be sugar-free, dairy-free and gluten-free so that your health-conscious girlfriend will have her share of the pie without any allergy issues. Over the years, I’ve figured out how to do it, so that my dinner parties can be a place for everyone to relax and indulge, without anyone worrying about being unhealthy or missing out. Here’s a new recipe that includes one of my favourite ingredients, chocolate, in a super-healthy way that’s also ridiculously luscious. It’s best to use raw chocolate and raw cacao powder to make this tart, but if you can’t find it, substitute with high quality organic dark chocolate. You can find raw chocolate and raw cacao in Whole Foods Market stores. It’s also available online in the UK and Europe at Raw Living, and in the USA at Raw Food World. Both are excellent independent businesses run by friends of mine, and both of these online stores offer high quality organic raw ingredients you can trust. 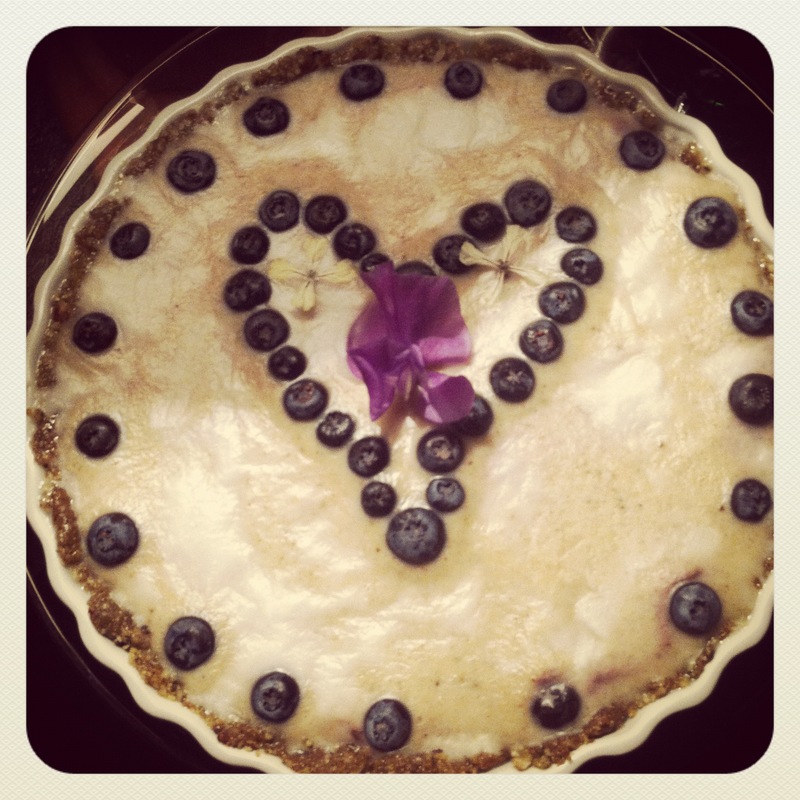 So, now you have your sources of ingredients, here’s my Chocolate Blueberry Tart… enjoy! 1. Mix all of the tart shell ingredients thoroughly in a bowl. 2. Press into a 10″ / 25 cm tart dish to form a crust. 3. Refrigerate for at least an hour, or overnight. 4. In a blender, whizz all of the filling ingredients. 5. Taste a little, and add more spices and salt, to taste. 6. When it’s ready, pour the filling into the shell. 7. Refrigerate the tart for at least four hours, but if possible, overnight. 8. When the tart has set, mix the icing ingredients. 9. Pour the icing onto the tart carefully. 10. Decorate with extra blueberries and flowers. Irish moss is a variety of seaweed, and it’s easy to make an extremely versatile and super healthy gel out of it that you can keep in the fridge ready to be used any time. It’s used as a thickener and a gelling agent, and is invaluable in tarts, quiches and in ice-cream to adjust the consistency to perfection. It’s also known as carrageen, and is often listed in the ingredients of ice-cream. It’s the ingredient that transforms this tart filling from a smoothie into a creamy topping. You can buy Irish moss online in the UK and Europe at Raw Living, and in the USA at Cafe Gratitude. It’s also increasingly available in stores across America, but in the UK and Europe, your best bet is to get it from Raw Living. Here’s how you make Irish moss gel, which I keep in a mason jar in my fridge at all times. Rinse 1/2 cup Irish moss several times to remove any sand. In a bowl, cover it with water and leave it to soak overnight on the counter, for about 8 hours. It will double in size. In the morning, discard the soaking water and throw the Irish moss in a blender. Add a cup of water and blend for about a minute, until it’s turned into a smooth puree. Transfer to a glass jar with a sealed lid, and keep in the fridge. 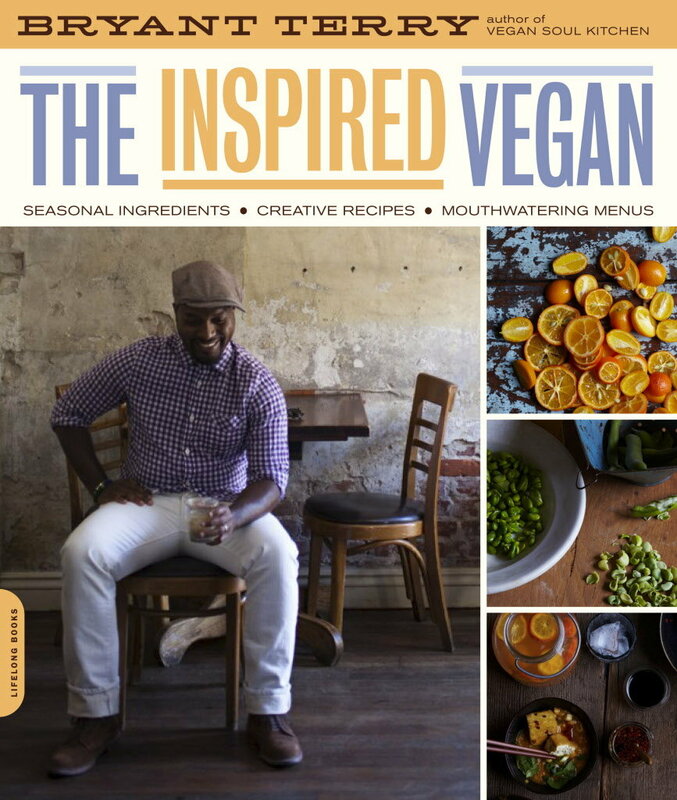 This exceptional book brings together Bryant Terry’s passion for flavor and deep experience of food activism in such light and subtle measures that you could be fooled into believing the author is purely taste-led. You’d be wrong. Bryant is into food because it’s a tool to connect people, and to explore our shared and unique histories and cultures. Much of the lightness of the book comes from the pure deliciousness of his meals. These recipes prove that refraining from animal products can lead to flavors so awesome, they will satisfy the taste-buds of the most avid meat eater. There are musical suggestions that accompany each recipe, and they’re well-considered, revealing the author’s lifelong appreciation of music, particularly records by African American artists. The first section of the book focuses on how the recipes are built, dissecting the layers of salt, fat, herbs, and acid, looking closely at ingredient groups like grains, vegetable proteins, and greens, and considering how processes like caramelizing can be utilized to add deliciousness. Bryant remembers the politics of food, gently, about food poverty and food deserts, about farm workers and fair wages, and organic ingredients for healthy people, healthy souls and healthy planet. And about the balance of healthy and hearty, culture and cuisine. I am delighted I discovered Bryant many years ago through his first book, Grub: Ideas for an Urban Organic Kitchen (written with Anna Lappe, another brilliant food activist in New York). Since that book and subsequently meeting him in San Francisco, Bryant has consistently inspired me through tastes in his writing, through his observations and wisdom, and more recently, through his tweets! 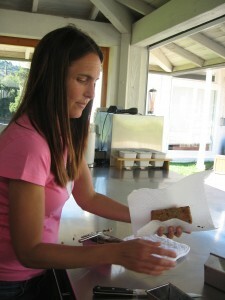 Lisa Josefsberg bakes banana bread so delicious you’d never guess it’s wheat-free, sugar-free and dairy-free. Super moist and delightfully nutty, it’s totally sweet enough to fool her husband Ken and daughters Natalie and Stella into munching big slices straight from the oven, blissfully unaware of it’s healthy credentials. I was lucky enough to eat some on Sunday too, straight from the oven, served on a hot pink platter on a hot sunny day. Yum. Set the oven to 350 degrees. Mix all the dry ingredients together, then add the egg, juice, bananas and oil. Pour the mixture into a muffin tray, or a large loaf tin, or three small individual loaf tins, and put in the hot oven. If this is made as one big loaf, it takes about 50 minutes to cook, but if the mixture is divided into smaller batches, it will cook much quicker. Keep checking as it bakes. The loaves should be very moist, so be careful not to over cook. Lisa’s trick is to freeze bananas when they’re really ripe. When you take them out of their skins later they are so soft and liquidy that they instantly work great in recipes like this! Also, if you’re feeling lavish, try adding a few tablespoons of mini chocolate chips for a little melted chocolate kick. Alternatively, play with adding a little cinnamon, vanilla essence, ground cardamom or fresh strawberries. If you have grapevines in your garden, it’s time to learn how to make dolmades. When you tie grapevines to train them, a few invariably break off, however careful you are. This classic Greek dish is made by blanching grape leaves, then rolling them around a stuffing mixture such as rice, minced vegetables and ground meat. Grape leaves are high in resveratrol, the same phytochemical that makes red wine good for your heart. Resveratol is a powerful antioxidant, and the most concentrated form of it in nature is grape leaves, which have a much higher content than the grapes themselves. Dolmades are best made on a leisurely Sunday afternoon, because although they’re easy, they’re not quick. Dolmades are fiddly, but they’re fun, and the texture and taste is wonderful. Very homey and satisfying. Try rolling loving thoughts and kind wishes into every parcel for extra flavor. Picked grape leaves need to be prepared within a couple of hours or they will wilt. Choose big leaves to stuff, as the little ones are too tender as well as being too small to make a meaningful dolmade. To prepare each grape leaf, cut the stem right at the base of the leaf, then blanch a pile of flat leaves in a pot of boiling salted water for about 4 minutes. Lift them out with a pancake flipper, and lay them flat to cool down. 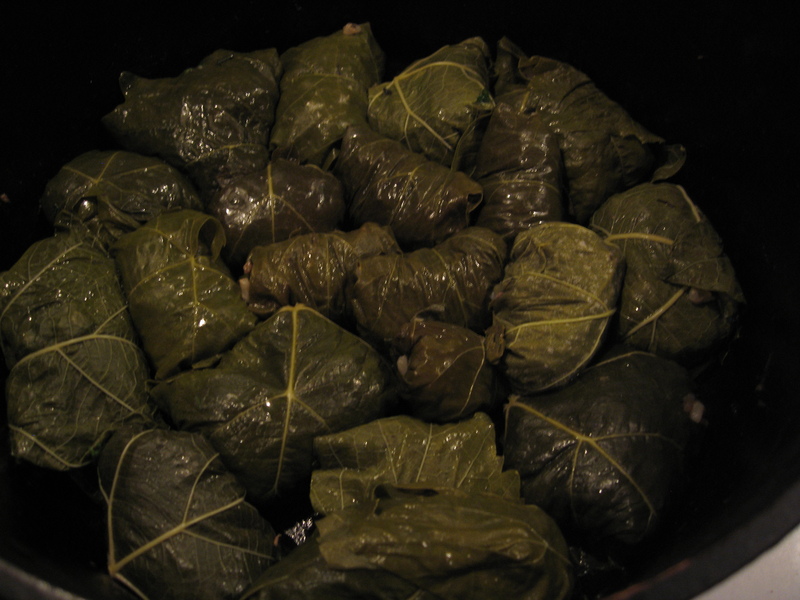 If you’re not ready to make dolmades on the day you have fresh leaves, lie them flat in a plastic bag, remove any air, and freeze for up to 6 months. If you are ready to roll, you need to cook some stuffing ingredients. My dolmades tonight were stuffed with organic ground beef, organic short grain brown rice, minced onions and bell pepper, chopped oregano, flat leaf parsley and oregano, and crushed garlic. However, there are a zillion stuffing mixtures that would taste wonderful, including vegetarian and vegan ingredients, like tofu, beans, cheese and tomatoes. Line a full layer of colmades into a heavy pot, add a little liquid and bake at 420 F for 20 minutes. Serve with a fresh Greek salad salad drizzled with delicious olive oil. Sauerkraut is the easiest thing in the world to make, last forever, is much healthier for you than the ingredients it’s made from, and is super-good when served on the side with sausages and mashed potatoes! All you need is a big glass mason jar with a rubber seal lid, a potato masher, a big plastic bowl, a knife and board, one organic cabbage, and a tablespoon of salt. Firstly, boil your mason jar to sterilize it, then set aside. Remove any outer leaves that you don’t like the look of and rinse the cabbage. Cut it in half lengthwise, then slice along its perimeter into half-moon strips that are roughly 1/4″ to 1/2″ wide. Put a quarter of the shredded cabbage into your bowl, add all of the salt, and pound hard with the potato masher. The idea is to bruise the leaves to hard that they wilt and release their juice. After about 5 minutes, empty the contents of the bowl into the clean mason jar. Refill the bowl with more cabbage and repeat the same process of pounding it. Repeat this step until all of the cabbage has been processed and is in the jar. 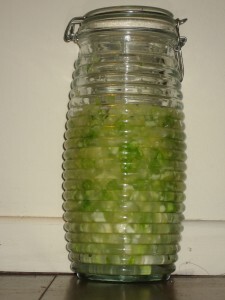 Press the cabbage down in the jar so that the juices are at least an inch above the cabbage. Seal the jar with its lid, and put in a cool dark cupboard for a week. Every few days, remove the jar and open the sealed lid to allow fermented gases to escape, then re-seal and put it back in the cupboard. After about a week, transfer the sauerkraut to you fridge, when it will keep indefinitely. Eat cold, or gently heat so you don’t destroy the beneficial cultures that are in there, which are just like the good stuff in yogurt.